Recently I became a member of the Purex Insiders program. The first product I received is the new Purex Complete Crystals Softener to try. YES... I said Crystal Softener. 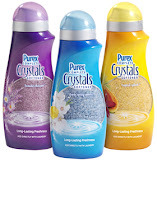 The Purex Complete Crystals Softener are easy to use. You simply measure out the amount needed and add it at the beginning of the wash cycle. There is no need to wait for the rinse cycle or having to deal with liquids The scent of the Purex Complete Crystals Softener was very noticeable but not to strong.... nice and fresh. Purex Complete Crystals Softener; a purer way to get laundry that smells clean and fresh for weeks. 92% natural, this product’s unique crystal form works differently than traditional oil-based softeners that coat fabrics with oily residue, because it infuses fibers with long-lasting fragrance. In addition, since you add it directly with your laundry, this means no more waiting for the rinse cycle, no messy residual gunk in your washing machine, and no more stains from spilling liquid fabric softener. Laundry scent lovers will perk up as freshness is infused into clothes with this new fabric softener. Over time, traditional oil-based softeners coat fibers causing harmful oily residue to accumulate. Purex Complete Crystals Softeners penetrate fabrics to reduce fiber entanglement and smooth frayed fibers providing a naturally soft feel. Why struggle with plastic fabric softener balls, risk staining your clothes or waste time waiting for the rinse cycle? 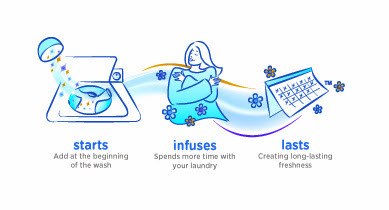 Simply add Purex Complete Crystals Softener directly with your laundry at the beginning of every wash cycle to infuse fabrics with long lasting freshness. Do ALL of your laundry—worry free! Purex Complete Crystals Softeners are safe for all laundry and will not harm, wear down or discolor your fabrics like oil-based softeners. Safe for all fabrics, including baby clothes, athletic wear, towels, and whites. The product won’t harm your clothes and is safe and convenient for the entire family! The Purex Complete Crystals Softener comes in a variety of scents such as: Fresh Spring Waters, Lavender Blossom and Tropical Splash. It has a suggested retail price of $3.99 to $5.99 depending on the retailer and is available in food, drug and mass retailers nationwide! I have already used my sample bottles and have the Purex Complete Crystals Softener on my list so I can stock up on my next trip to the store ! It is not a Softener. It only freshens the laundry. It does a great job with that. But I was looking for a crystallized softener that I can take on trips to use with my Scrubba hand clothes washing bag. I bought this after using Downy Unstopables because it's so much more affordable. You get what you pay for. I've added a full cap to the laundry and there's hardly any scent, and it definitely doesn't last. In fact, by the time the clothes come out of the dryer, there's no detectable smell. Also, the crystals don't always dissolve, leaving blue spots on my clothes. I usually wash my clothes in cold water, so I tried putting the crystals in the cap and filling the cap with hot water. They still don't dissolve very well.